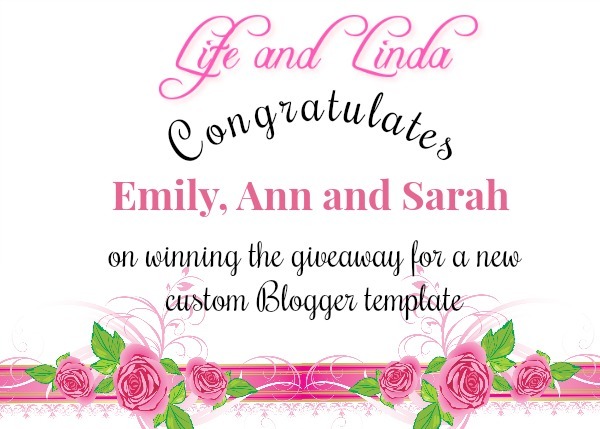 Congratulations to three bloggers who won a new Blogger template. Now let the fun begin. They can each build their Blogger template to their own liking. Thank you Diana. You are always so sweet. I'm so excited - Thank you, Linda!! This should be fun! Well, shoot I was hoping to win this, but congratulations to these three ladies. I can't wait to see what they do with this opportunity! Hi Carol, there will be more giveaways in the future. I'm thrilled, Linda! Can't wait to take a look and get started. Thank you! By all means, have fun and get ready for a new look. Congrats. Congratulations to Emily, Sarah and Ann! Congratulations to the happy winners! Thank you again, deart Linda, for this wonderful Giveaway! Congrats to these ladies for winning!